NEW YORK, NY--(Marketwired - December 05, 2017) - Box 1824, the cultural research group that identified the globally adopted fashion term 'normcore,' has turned the notion of Gen Z and post-Millennials on its head, identifying and redefining the current youth generation as GenExit. 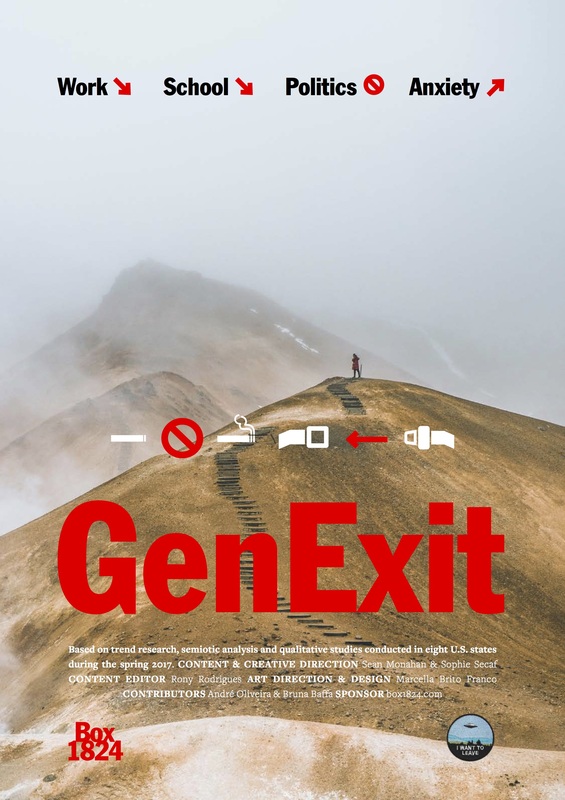 Released today, the GenExit Report reframes the pivotal post-Millennial generation, arguing that, in their rush to label and characterize today's youth as Gen Z or "Millennials on steroids," marketers and the media have oversimplified them and, as such, have gotten it all wrong. Previous research on Gen Z provided a polarizing view of this generation, with either total optimism that Gen Z would change the world or total pessimism that Gen Z would destroy it. Rather, this group is more focused on avoiding commitment and having an exit plan. Previous labels are premature and miss the point, argue the report's authors Sophie Secaf, researcher/creative strategist, and Sean Monahan, artist, writer and strategist. "The GenExit report -- and moniker -- gives a sharper, more robust, holistic picture of this pivotal group, making a clearer path for marketers and institutions to communicate with a generation of people who are non-committal and always have one foot out the door," said Secaf. is skeptical, pragmatic and agnostic in every aspect of life - politics, internet, school, etc. For Institutions: GenExit's realism and pragmatism is leading to a crisis of institutions as they are leaving schools and universities; leaving political parties (in favor of third-party affiliations); leaving religious organizations; and starting jobs with one foot out the door. For Social Media: The shedding of the personal brand also means the end of social media as we know it. Snapchat is GenExit's platform of choice because it is more real, intimate and ephemeral than the likes of Facebook and Instagram, which teens see as exhausting. They want to share impermanent moods, not have a permanent diary of all of their mistakes. For Marketers: GenExit is more receptive to brands than their millennial predecessors, but only if the brands earn their respect and if they perceive the brands as cool and forces for positive change. For Mental Health: GenExit is experiencing skyrocketing rates of depression and anxiety. 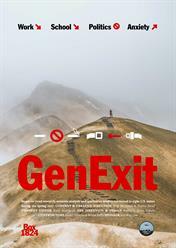 The complete GenExit Report is available now for download at http://www.box1824.com/. Culture is moving too fast for brands to be playing catch up. At Box1824, we identify the consumers living the future in the present. Our proprietary research methodology is built on investigating how ideas move through culture, from innovators to influencers to the market at large. Box1824 is a consultancy based in New York, São Paulo and Mexico City. Released today, the GenExit Report reframes the pivotal post-Millennial generation.